Hello, readers. So, on my journey homeward from a lovely semester in Sydney, I decided to make a little detour to (sort of) nearby Malaysia, to stay with my sorority sister and her family in Kuala Lumpur (aka KL)! I went into this trip completely in the dark about Malaysia and will share with you some of the things that I learned and that surprised me about this amazing land. It’s an Islamist country. Alright, I’ll admit that I didn’t even know there were Asian Islamist countries. But Malaysia is one of apparently a few, including Indonesia and Brunei. This means that about half the women on the street wore head scarves, that trains had coach sections for ladies only, that during Ramadan rule-breaking (eating, drinking, etc) is punishable by law, and that schools and many public areas were equipped with prayer areas to step aside in. It’s a melting pot of cultures. Malaysia mostly consists of three groups: ethnic Malay, Chinese, and Indians. The way these three groups have melded together has led to the creation of a beautiful culture that works very well together. The Hasa Malay, Chinese, and English are used widely. Islam, Hinduism, and Christianity work together seemingly without issue. People don’t seem to judge, but accept all. The food (ohhh, the food) was an amazing mix of rice dishes, noodle dishes, and curry mix. Hail all things spicy. Kuala Lumpur, and Malaysia as a whole is a large Oil and Gas Hub. What this most notably means is that there is an enormous class divide. The super-rich live among the super-poor, leading to a varying scope of Skyscrapers and high-rise condos just minutes away from the most broken down of slums. This disparity also makes the city a little more dangerous. Money matters are twisted. One US dollar is approximately equivalent to three Malaysian Ringgit. What this means is that products from overseas cost about 3x as much in Ringgit as they would in dollars. While this may make being a tourist attractive, the local minimum wage is about 9 Ringgit/ hour (or $3 USD), meaning that many goods are insanely expensive to natives, but cheap for tourists. I bought Life of Pi for my plane ride home. For me $39 Ringgit ($13 USD) was nothing, but tell me, if you were a young local would you read if a book was nearly 40 dollars? 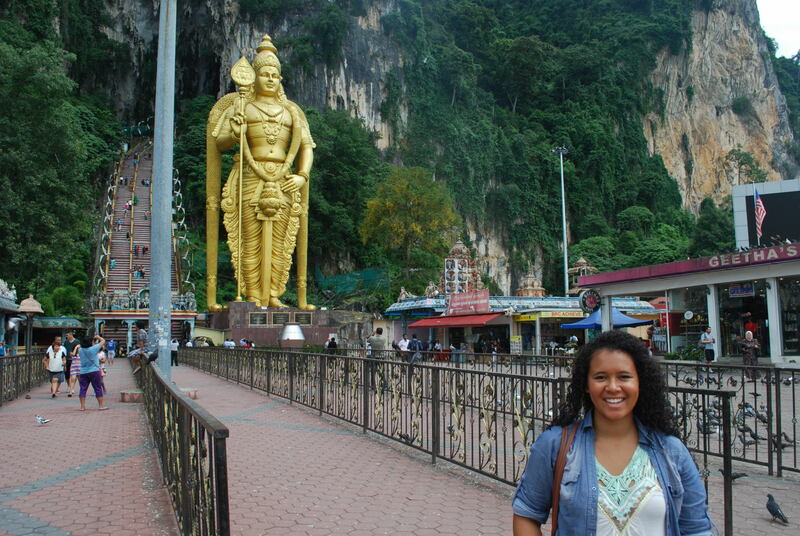 Lord Murugan in the background of the caves! He was like 6 stories tall! Little India of Kuala Lumpur!